Waze vs. Google Maps: Where Should I be Advertising? The growth of navigation app advertising is evidence of a growing trend in digital advertising. Marketers are learning use online advertising to drive physical traffic. Waze and Google Maps are two of the most popular platforms for this purpose. 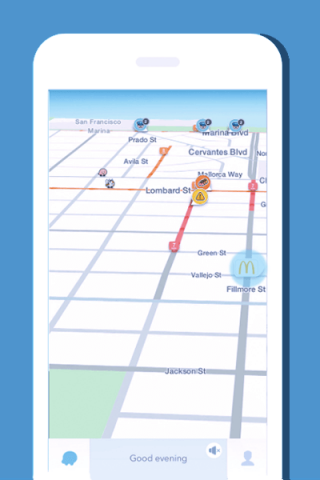 Both Maps & Waze are great opportunities for local search ads. Looking at the ad formats we can see that there are a lot of similarities between the two platforms. 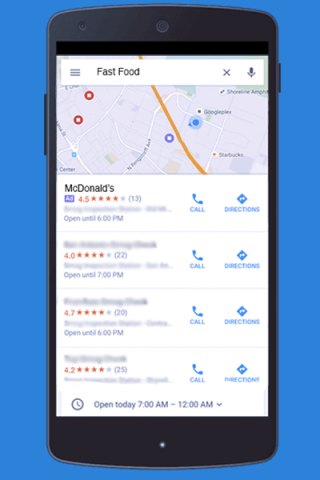 We will take a closer look at each of these ad types to see how the available marketing services for Waze and Google Maps differ. Their services look similar on the surface. A deeper look will show that they actually offer very different methods of navigational advertising. 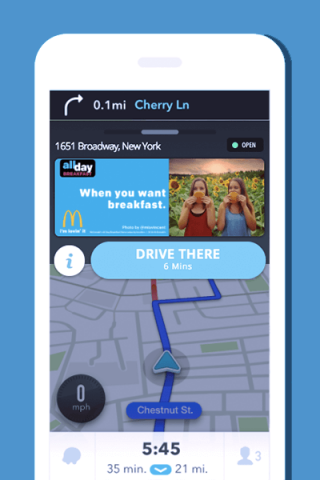 The Waze ad types are very direct advertising types to drive immediate or impulse purchases. 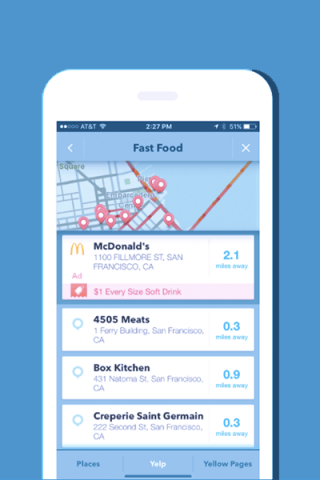 Some of the most common businesses on Waze are gas stations, restaurants, coffee shops, and retailers. They are very in-the-moment ad types, encouraging visits when you are ready to go. Waze branded pins place a pin on the map. For example, the McDonald’s logo on the map above. This indicates the location of a nearby McDonald’s restaurant. More information such as the promotion shown on the screen above and the directions to the restaurant are brought up by a tap. 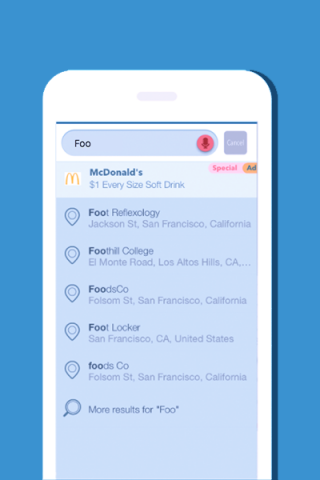 This ad type lets users see that your business is close to their route. They can take immediate action to drive to your location, or save the info for later. Pinned locations also appear on promoted search. 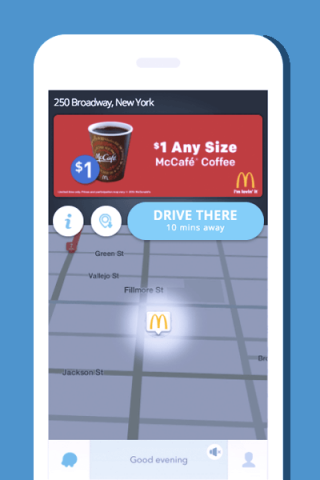 Waze promoted search allows advertisers to show up during the search phase. Businesses receive the top search position on related or nearby searches. In the example above, when a nearby user starts typing a related search term, like food, the McDonald’s ad appears. The post is marked as an ad. By tapping on it the user can see special offers, creative, location, and directions. The nearby arrow shows that a promoted business is nearby. It is an arrow that points offscreen. By tapping the arrow the user is directed to their nearby pin. The arrow appears on screen when you load up the app before you are on your way. It gives your business a chance to be found before the search even begins. The zero-speed takeover ads are screen takeover ads. They only appear when the car is fully stopped. Hence the zero-speed nomenclature. This serves a dual purpose. Firstly, this shows the ad when attention is at it’s highest. Secondly, it helps to prevent distracted driving. Google Maps ads are not as singularly focused on immediacy as Waze marketing. In addition to immediate action, Maps also has ad types positioned a step earlier on the conversion funnel than Waze ads. It is also available outside of the Maps app on Google search on mobile or desktop. Much like the Waze branded pins, Google Maps promoted pins mark a nearby business’ location on the map. By interacting with the pin, the user can get more information or get directions to the pin. When performing a search in the Google Maps application, promoted search results may appear. A related search such as fast food, in the example above, will show an ad for a fast food restaurant. This top search position gets higher visibility, giving users the ability to interact or navigate directly to the promoted location. One of the important distinctions between the Google Maps & Waze advertising platforms is that Google ads translate outside of the app. 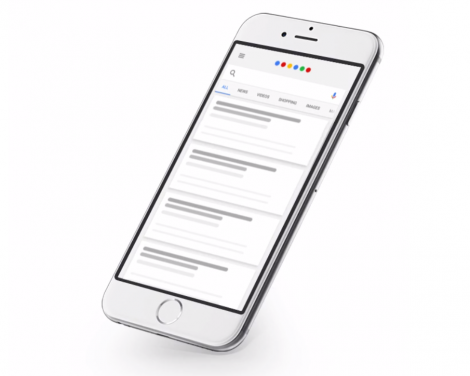 Users who search with Google on mobile or desktop will receive promoted search ad when they are relevant. Recently, Google pushed out Local Inventory Ads. These are PPC ads that drive foot traffic to brick and mortar retailers. Local Inventory Ads are essentially Product Listing Ads that favour local business. Preference is given to nearby stores with in-stock products. By clicking on the ad the user can buy online or get directions to navigate to the store. On the Google Maps app this is coming into play as well. When a user types in a service, product or business type, relevant business are pinned on the map. 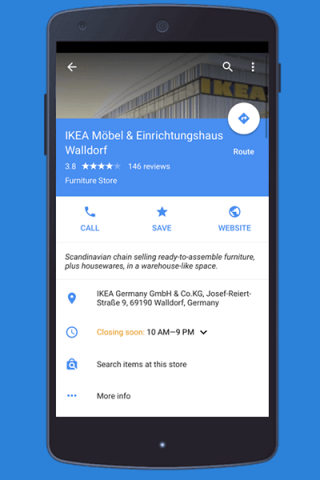 For example, searching furniture in Maps would bring up furniture retailers like Ikea. If a user tapped on the Ikea pin they would have options for directions, distance, and more information. Choosing more information would pull up a page like in the above image. A business that uses Local Inventory Ads would have the listed option, “Search items at this store.” This will let the user see what products are in stock, so they know they aren’t wasting a trip. By keeping your inventory up-to-date you can outperform the local competition. Many of their available services for Waze and Google Maps advertising are similar. They fulfill similar needs through different approaches. Both have value, but depending on your business and clientele, one may have more value than the other. If you are launching a campaign from scratch setup can be frustrating. Especially if you are do not have experience with a platform. In this area, Waze wins. 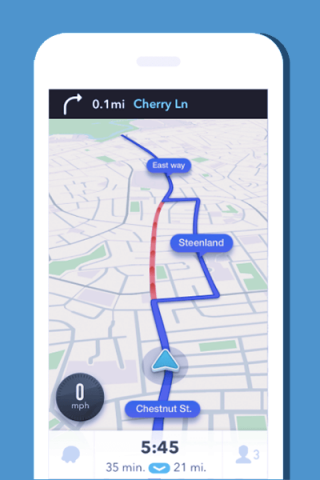 The Waze setup is fast, easy, and guided. However, if you are already set up on Google AdWords & Google My Business then setting up ads is fairly quick & simple. 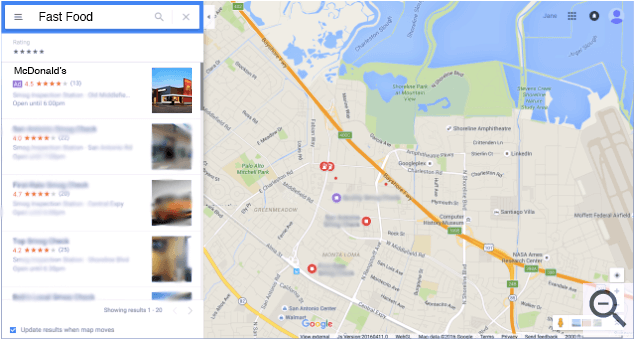 Even if you choose not to advertise on Maps, we would strongly recommend setting up a Google My Business Profile. It is a free service and enhances your local SEO ranking, allowing you to outperform competitors on local search. It is important to consider which app your client base is more likely to be using. Only Waze app users will see Waze Advertisements. 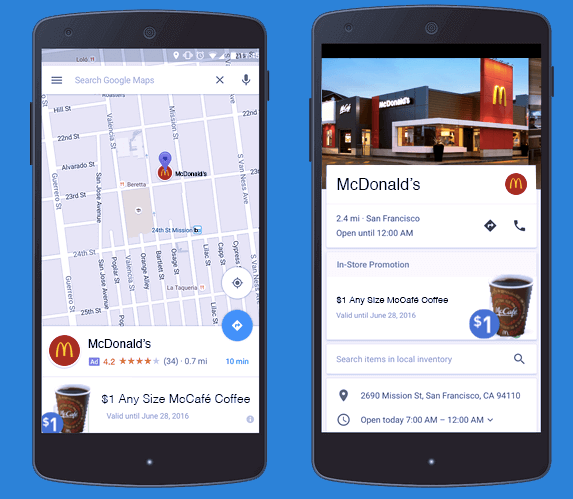 Google has an advantage here as their ads can be found through the Google Maps application, or using the map function in Google search. Another consideration about your clients is how they are using the app. Waze is heavily focused on drivers. If your clientele is more likely to be walking, bussing, or biking, the Google Maps app may be better suited to their needs. Waze ads are best suited to immediate needs. They are seen by people who are ready to go or are already driving. That is why brick and mortars like coffee shops, restaurants, and gas stations are so successful on Waze. It makes it very easy to make convenient impulse purchases at nearby stores. Retailers can also do well with Waze, usually performing best as branded pin or promoted search. These usually find success when a user is opening up the app nearby or is inputting a related search (which drives ready-to-buy customers). The ability of Maps ads to show on desktop and mobile searches means it can capture an audience at an earlier stage in the customer journey. For more impulsive/immediate services, such as a gas station, this is not as necessary. For a product – for example, a car – where users tend to do more research, it is beneficial to capture them earlier. Waze and Google Maps have different ways of charging for their ad services. Waze uses CPM – charging per 1,000 ad impressions. Maps charges by engagement. What that means is for Waze you pay to have people see your ads, and for Maps, you pay when people interact with your ad. There are pros and cons to each. Paying by impression is generally the cheapest way to get seen the most. But paying by engagement generally drives more qualified traffic. Charges by engagement usually mean that ads with higher engagement will be shown more often. This can mean it is harder to get shown if your competitors are performing well. So Should I be Advertising on Waze or Google Maps? For brick and mortar businesses, both Google Maps & Waze advertising platforms add value to your marketing efforts. Especially if you have nearby competition. But which should you use? Each has their own benefits and limitations, and you can weigh them against your own business needs. However, if resources allow, the best option is to use both. Both Google Maps & Waze are popular apps with minimal overlap. If you really want to capture your full audience, you need to be on both platforms. On Maps, your competitors are likely already there or will be soon. So you need to be there to be competitive. With Waze, you have the opportunity to be an early adopter of an already proven platform. The earlier you get on, the better to get a leg up on your competitor. For more insider SEO & PPC advice right in your inbox, subscribe to the Pedestal newsletter. Or contact us for a free marketing assessment today!